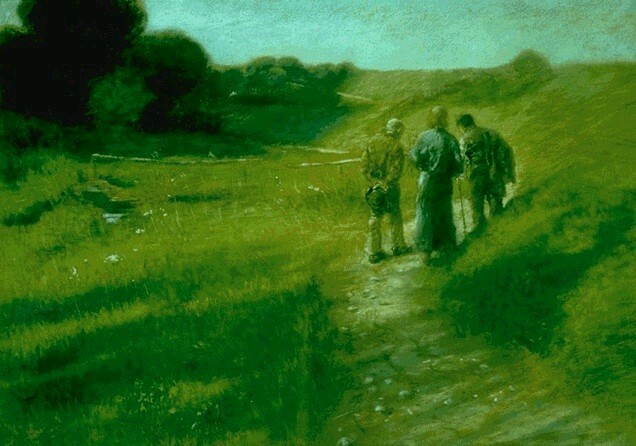 Fritz von Uhde 1848 – 1911 "Walking to Emmaus"
Henry Saulnier headed up the ministry of Chicago’s Old Pacific Garden Mission from 1940 to 1986, where he was a bundle of compassion and whirlwind of activity. Even into his 80’s, Saulnier endured increasing arthritic pain to work late into the night at the mission. During Gospel meetings at invitation time, he regularly hobbled up and down the aisles of the mission auditorium, tenderly placing an arm on the shoulders of sin-ravaged men, nudging them to go to the prayer room for personal counseling to receive God’s pardon and a new life in Christ. What kept him going? How did he motivate others? He once summed up his philosophy of Christian work in one unconventional sentence: Work like the blazes, but give God the glory. What Mr. Saulnier had was Christian zeal. 1. Counterfeit zeal looks one way while pursuing something else. It is the hypocritical zeal of Jehu who, in 2 Kings 10:16, boasts about seeing the glory of the LORD, but really has his eye on his own gain in the kingdom. 2. Blind zeal is what Romans 10:2 describes as pretending to honor God without truly knowing Him. 3. Turbulent zeal is bitter envy or jealousy (James 3:14). 1. God-centered zeal. Because the author and object of zeal is the living God, the zealous Christian has a fervent love for God and craves His presence. 3. Self-reforming zeal. Thomas Brooks said zeal “spends itself and its greatest heat principally upon those things that concern a man’s self." Beginning with a sincere examination of self is crucial for it prevents the damnable error of hypocrisy. 4. Active zeal. Having knowledge of God, whom we love, we are zealous in devoting ourselves to the duties required of us in the gospel. 5. Consistent zeal. The bodies of cold-blooded animals take on the temperature of their environment. Warm-blooded animals have bodies that strive to maintain a steady temperature. The zealous Christian is a warm-blooded creature, resisting both the lethargy of cold heartedness and the fever of fanaticism. As some are mistaken concerning the nature of true boldness for Christ, so they are concerning Christian zeal. ’Tis indeed a flame, but a sweet one; or rather it is the heat and fervor of a sweet flame. For the flame of which it is the heat, is no other than that of divine love, or Christian charity; which is the sweetest and most benevolent thing that is, or can be, in the heart of man or angel. What do we do is our Christian zeal is lagging? 1. Pray for grace to rightly understand the need for Christian zeal. 2. Pray for grace to be motivated rightly for Christian zeal. 3. Pray for grace to be humbled by your lack of zeal for Christ and His glorious kingdom.